A sweet engine leaves the page/screen and choo-choos through the redwoods. Thomas the Tank Engine and his friends steam into Felton from July 24 through 26 and July 31-Aug. 2. DAY OUT WITH THOMAS: Picture yourself at age 5 (surely your memory can reach back to that time, or at least your favorite books and television shows and sneakers and cardigan and hairstyle). If your mom had told you that you were going to go somewhere, in the woods, to see your most obsessed-over character (feel free to insert H.R. Pufnstuf or Moley from "The Wind in the Willows" or Stuart Little here), would you have absolutely freaked out? Gone over the moon? Jumped up and down for ten minutes straight? Probably, unless you were a more skeptical kid, the kind of tot who needs to see the proof in the pudding. 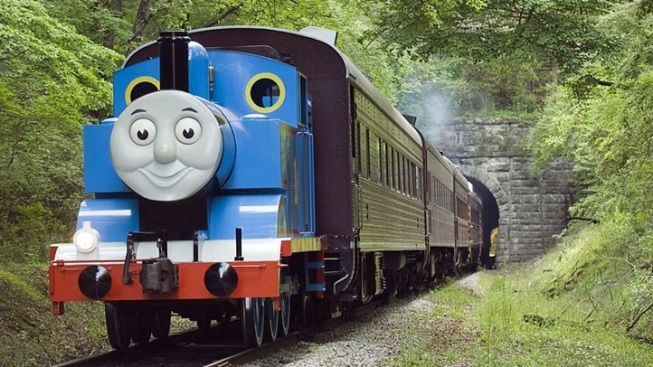 For modern kids, Thomas the Tank Engine easily fills that "most obsessed-over character" and there is a way to put fans and bright blue engine together, for fun afternoon out in the woods. The proof is very much in the pudding at Roaring Camp Railroads, in Felton. The Santa Cruz-close spot is known for its already legendary steam train runs, but once a year it puts out the proverbial welcome banner for Thomas, his storybook friends, and all of his many fans and their parents. Those summery weekends are choo-choo-ing this way, and tickets'll speed away like a determined engine who is off down the rails to help a pal in need (and, yes, Thomas is so often that helpful engine). The dates are July 24 through 26 and July 31 through Aug. 2.